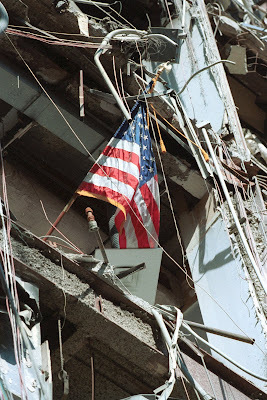 Photo courtesy of James Tourtellotte The American flag flies precariously out of an office window at the New York Customhouse at the World Trade 6 building at ground zero. 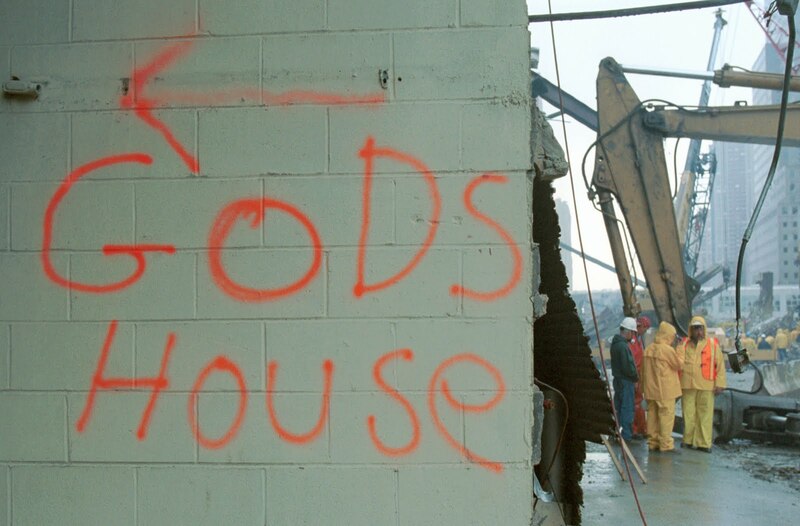 Photo courtesy of James Tourtellotte Construction workers painted "Gods House" on the exterior wall of the U.S. Customhouse at the World Trade Center to direct construction workers and rescue crews to the site of the crosses within the building. 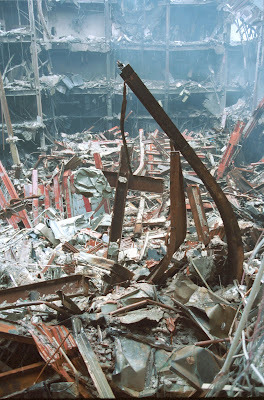 Photo courtesy of James Tourtellotte This debris field in the center of the U.S. Customhouse was caused by pieces that fell from the North Tower. 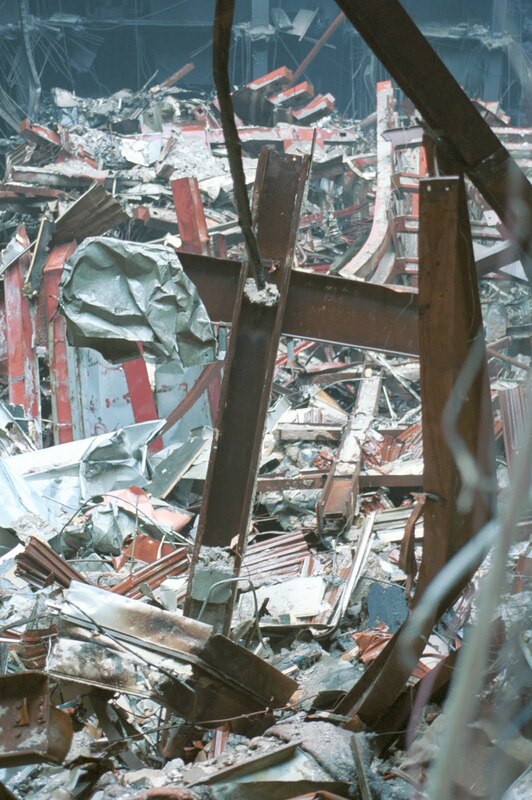 Steel beams formed several crosses in the midst of the debris field. Photo courtesy of James Tourtellotte This cross, one of several found in the debris of the U.S. Customhouse, was preserved by construction workers and blessed by clergy in a solemn ceremony held outside the building on Thursday, October 4, 2001. 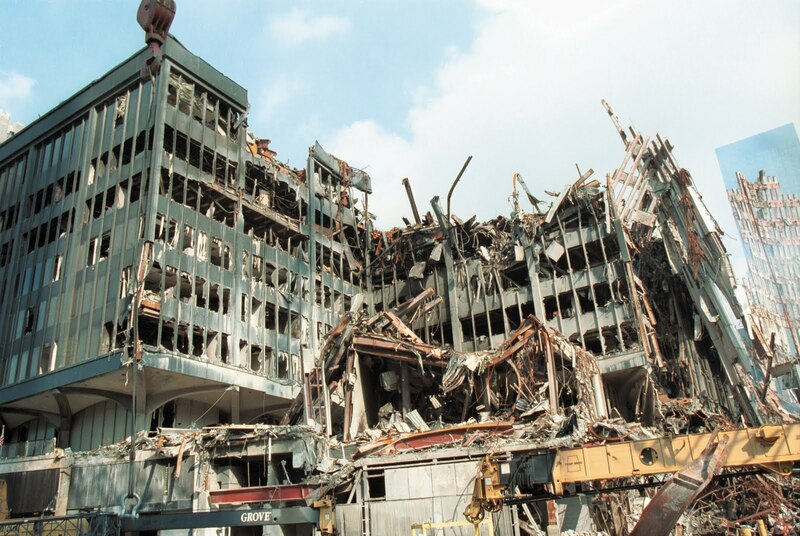 Photo courtesy of James Tourtellotte U.S. Customhouse - World Trade Center Building #6 - following the attack. 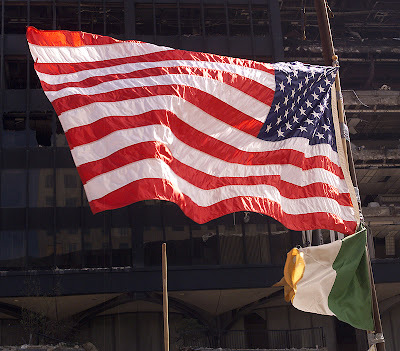 Photo courtesy of James Tourtellotte The American Flag flies in front of the remains of the NY Customhouse. From the kitchen of One Perfect Bite...It was years ago. It was yesterday. When the air finally cleared, a camera zoomed to a devastating shot of the US Custom House - World Trade Center Building # 6. I gasped and as my brain processed the scene I began to cry. I knew this building well. My job included technical responsibility for custom's clearance and duty payment and I was often here for consultation and program updates. I last visited in 2000, the year of my retirement. At that time, # 6 stood tall and strong and proudly flew colors that spoke of permanence and freedom. It wasn't a particularly handsome building, but its squat strength bore an air of invincibility that seemed to belie the fact that all walls eventually crumble. Whether it was a vagary of fate, or the work of a higher power, all who worked here were evacuated before # 6 imploded. At the very least, it was a tender mercy shown on that surreal and brutal day when few, if any, miracles occurred. While the walls collapsed, those who understood the importance of symbols kept our colors flying. I thank them for their efforts. I thought this recipe for firehouse chili, developed by a fireman, would be appropriate for this post. Jerry's recipe, as well as recipes developed by other firemen, can be found Here. Brown hamburger or pork, drain & set aside. Brown stew meat in butter with onion and bell pepper. Place ground beef, stew meat, onion and bell pepper in crock pot. Add 1 can of kidney beans, black beans, tomato paste and sauce, Rotel tomatoes, beer, and all seasonings to crock pot and mix well. Add water. Turn crock pot on high and cook until chili gets hot,about 1 hour. Reduce heat to low and cook 6 hours longer. About 1 hour before you plan on eating, add reserved can of kidney beans. Yield: 6 to 8 servings. Pink Saturday, sponsored by Beverly at How Sweet the Sound. It is good to read of miracles too! Great Post! Oh my this chili sounds perfect, all the textures and spices....I will make this one first; just as soon as it cools off a little! Thank you for a touching reminder of that day. My stunning moment came when I saw The Pentagon and could so easily envision the horror and devastation there. I spent five years in the building working near the point of impact. I recalled the feeling of safety in being in that fortress. It never entered my mind that what happened that day in New York, Pennsylvania and Washington D.C. could occur. It did. What an appropriate dish for "pink" Saturday. It looks four-alarm delicious. What a great post. Thanks for the photos and reminder. You and I are on the same page today. I was a few blocks away when it happened and I just wrote a tribute as well. The chili is such a love and clever way to remember the firefighters who gave their lives for our country. Great post Mary! I will never forget that day of horror and sadness in my life! So many brave fireman gave everything, so thank you for honoring our finest with this great recipe! This is such a wonderful tribute and a reminder Mary to thank our blessings. A beautiful and touching post. Memories or Nightmares, sometimes I can't tell the difference when I see these photos. Thank you!!! Thank you for ths post, the chili looks great, and the hearts of many are with all who gave their life nine years ago on 9/11. Yes, I think anyone with a soul gets a bit sad come 9/11 every year. I close my eyes and it feels like yesterday. What a great recipe you've served up in rememberance. our prayers are with those who died on 9/11 and their families- what a nice tribute, Mary! Truly a wonderful, touching post. Love your chili, so colourful, and I am sure just as tasty! With a tear in my eye now. Very fitting post, Mary. Sounds like a great recipe, also. We will never forget. Thank you for putting this post together. So sad. I met my husband shortly after 9/11 - it was the subject of many conversations and continues to be. God Bless all the families who were touched by this devastating tragedy. Mary, I appreciated your post on the eve of 9-11. We will never forget! I watched a somewhat depressing show on the history channel last night on the day we will never forget...so MANY brave people that day...so many innocent people too. Thanks again for your post, I will try your chili recipe soon. Your memories of the attack are so personal and sorrowful. A very touching story, and the pictures are unusual, horrible, and somehow uplifting all at the same time. You couldn't have picked a better recipe for this day than chili, the firman's favorite. It was years ago... it was yesterday. Love a good chili for sure! 9/11 will forever be a horrible horrible day in my memory. I wasn't close to the tragedy personally, but I will never ever forget it or the thousands of souls who lost their lives due to terrorism. it's a difficult thing to see the pictures, i remember where i was that day... chili? it's officially Fall. Check out this new product I'm testing out, you might be interested. Mary your post has really touched me! Thank you so much for putting this post together. It's funny, because as I'm sitting here reading your post, I am eating a bowl of chili. My son is moving back to N.Y. in a few days and requested me to make it. Thank you for posting this, I'd never heard that story before. You're right, miracles were rare during that time. The chili sounds awesome, but maybe too much for me. However, my nephew and his wife, if possible, would make it even hotter! Gonna send this right over to them. Thanks! A lovely tribute to those who lost their lives in the horrible tragedy. Very touching post, Mary. I remember the morning as if it were yesterday. A perfect post for the weekend. I will post tomorrow for the 11th. Thanks for visiting me. I have had your blog bookmarked for quite awhile, but not sure I have left any comments. Even today I feel so sad for what happened to WTC and people who were there in the building. I was listening to the radio today about the new WTC building and it was so sad to know that they are still uncovering human remains. It is totally a inhumane act. My prayers for the families who lost their loved ones. A very great post. Very touching. Thanks for remembering, Mary, and for your personal story of this building. I loved your idea of fireman's chili - who could ever forget the pictures of all those precious firefighters heading up the stairs. Thank you for sharing a story of your remembrance. I'm looking forward to more beautiful words and meals from your blog. Thankyou for this post. Best Wishes on this difficult anniversary. We all have to remember 9-11... Such things are pure madness! It's a great tribute, plus I love the recipe! A very touching tribute and reminder to all of us of the horrific events of 9/11. Our hearts and prayers are with the families who lost loved ones. I was in building 5. After diner tonight we went out on the front lawn & hung up our gigantic flag from the front tree. Bless all who lost their lives that day - the families that miss them & the response workers who saved some. What a good post. I'll never forget that day. My husband and i work in law enforcement (non-sworn) and I will never forget the moment that first plane struck. We thought it was a horrific accident...until the second one crashed. I didn't know you worked in the area previously. Thank you for posting that on the eve of 9/11. Wow, Mary, I got goosebumps as I read this! Thank you for keeping the memory alive. And Firehouse chili..what better way to honor those who sacrifice their lives for others! It was good to read your post tonight and to take the time to remember all the people that lost their lives and all the amazing people and miracles that occurred because of their valiant work. This chili recipe is a great tribute. Thank you so much for sharing! Such a touching tribute. It made me cry. I am still a jumble of emotions when I think of it. Can I use your words today? A day we will never forget; thank you for sharing your memories. Great post and love your blog recipes...Yum love this recipe - as it is still cold and this will certainly warm you up!!!! A very touching post. We can never forget all those innocent people and the brave firemen who ran in the buildings while everyone was running out. How they had the courage to do that is something that will always leave me in awe of them. God bless all those souls and God Bless America. Even I'm not an American, I still remember clearly about the attack! It was live from TV and everything happened so quickly! However, thanks for reminding. My prayers for the family who lost their loved ones. Hope you're having a wonderful weekend. 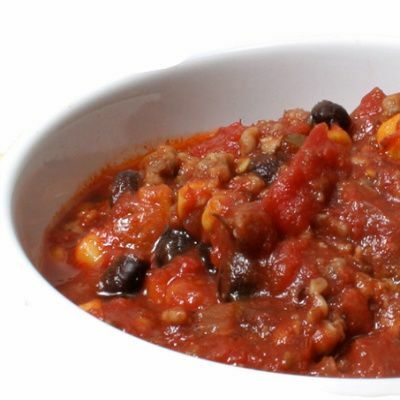 Btw, your firehouse chili sounds delicious & hearty. I was watching this on TV and I couldn't believe my eyes. My brother worked very close to the buildings and until I heard from him I was scared to death. I feel very sorry for all the innocent people around the world, who pay for the irrational decisions of a minority of people. Food always comforts our hearts. Your chili looks terrific. Yes, Mary, a day we will never forget. Such horrors. My daughter lived/lives 4 blocks from ground zero and saw it happen. The firemen were such heros! Very touching, thank you. I'm not really a chili fan, but this recipe looks yummy. I know my husband and son will enjoy it. Mary - thank you for the sweet note on my blog - I'm so happy you left it because it led me to your wonderful blog! This post about 9/11 was so touching. Perfect recipe for the day. Thank you for the somber reminder of a day we will never forget. Your chili dish sounds delicious. With all the spices, I bet my husband would like it! Mary, your words and pictures are a tender, personal and beautiful memorial to 9/11, a day none of us will ever forget. It was a day in modern American history must never forget. I remember how flags to buy were scarce, as people attached them to their cars. Churches filled to overflowing. Life has gone back to normalcy and the car flags are gone, and many churches remain half empty. I remember that day so well, and how I stared in disbelief as I watched that second plane hit. I dug out my photo album of my visit to NYC years before. It's hard to believe those towers are gone. We must never forget, but we must never hold on to hate. This is a great tribute. The chili is fitting, and it's a great way to welcome in fall weather. Very touching post and images Mary. Lets never forget. I love how you have honored 9/11 in such a meaningful (and yummy) way.....my heart goes out to all of those that have been effected in some way (big or small) from such a terror of devistation. Hugs! My area was greatly affected by the events of 9-11. We all know someone or several people who lost their lives in the attack. Everywhere you turned today there were tributes. I suspect that the day is not as easily remembered in other parts of the country. Thank you for your post that served as a great reminder. We must not forget. What a great post. The pictures are amazing. Today was emotional for sure, can't believe it's been almost a decade. Thanks Mary. I cry as I read this my friend; as you said it was yesterday it was a lifetime ago and it is still painful to recall...lest we forget that fateful day. In honor of those that lost their lives that day, I will make this delish chilli in honor of them! "It was years ago. It was yesterday." Exactly. Excellent tribute, Mary. Thank you. This chili sounds SO good. Great pictures and great chili! Thanks! Beautiful post. I love it. May we NEVER forget!